So, I’ve long wanted to get into urban beekeeping. I love honey, and I’ve been enthralled with the idea of caring for a hive ever since I saw the movie, “The Secret Life of Bees”. But honey-loving aside, there’s a far more important reason I want to get into urban beekeeping. And it’s because our bees are in serious trouble. According to recent research, bee populations are down 96%. 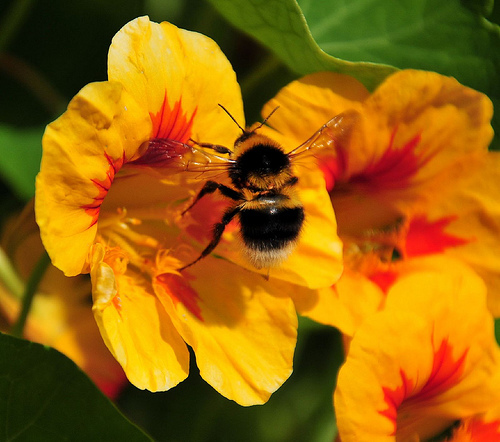 Want to learn more about why our bees are in such decline? Check out the post I wrote, Why Are Our Bees Dying? Now that I’m living in Detroit, I’m finally in a place where I can start a hive. After all, I have an abandoned house on my left, and my right. I live in a city that, amazingly enough, has abundant open, urban prairie and literally thousands of empty lots with native wildflowers and grass. And, there are thousands of personal and community gardens here. Yep. I think I’m ready. Now, this isn’t a detailed post on how to get started as an urban beekeeper. There are entire books written about that (the one I’m currently reading, “The Complete Idiot’s Guide to Beekeeping”, is actually quite informative). This post will list the basic steps you need to take to get your thoughts in order so the process doesn’t feel quite so overwhelming. It was like that for me…I wanted to get into this, but where the heck do I start? It seemed like such a foreign world, with a gazillion steps I needed to take. But now that I’ve read more about it, it doesn’t seem as difficult as I once thought. So, here’s are the basic steps for you to think about. I know the thought of keeping bees is a little…intense. You might think you can’t do it, or you don’t have enough space, or that they’re going to swarm out of the hive and kill both you and your neighbors. But there are tons of people keeping small hives in their backyards all over the country. 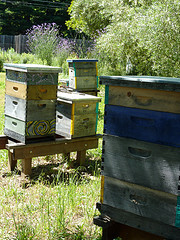 Want to see their hives, their yards, and hear their stories? The Daily Green put up an awesome picture-journey of regular people who are keeping bees all over the country. Once you look at it, you’ll be inspired to start a hive of your own. You can see it here. You may not legally be allowed to keep bees in your neighborhood. To find out, call your local city hall or check out this handy list of contacts you can call for your state’s beekeeping rules and regulations. Of course, “following the law” is entirely up to you. There are literally thousands of people in New York City (and plenty of other cities) that are involved with urban beekeeping. Technically, they’re breaking the law. But they don’t care. You don’t need acres and acres of land to keep bees. Like I mentioned, people in New York are keeping bees on their rooftops. Where there’s a will, there’s a way. You’ll likely need at least 1/10 of an acre to keep bees in your yard. If you spend a lot of time in your backyard, however, you’ll want upwards of 1/2 acre. This will give you, and your family, space from the bees so you can each do your own thing. I haven’t figured out where I’ll keep my bees. I have a spacious backyard in the house I’m living in, but I share this house with three other flats, who all have dogs (like me) that use the backyard. I’m thinking, at least right now, that the backyard in the abandoned house on the right will work just fine. I might also sneak a garden in there as well, since the sunny yard is nothing more than a jumble of weeds, so that would be an added bonus to keep the bees there. So, there’s an entire chapter on beehives. That is, the box you’re bees are going to be living in. The most common hive is the Langstroth Hive, which you can see on the right. These are regular boxes with 8 or more “frames” inside, full of bees and honey. In addition to the box, you’re going to need a stand to keep the hives off the ground. You’ll want to consider your ambitions and strength when choosing how big to go on your boxes. One box with 8 frames weighs less than 50 lbs. when it’s full of honey. A 10-frame box full of honey weighs a whopping 100 lbs, which would be a bear to move. Top bar hives are fairly cheap to put together, and it’s easier to work with the bees. But, you don’t get as much honey as you do with the Lanstroth hives. Are you a crafty woodworker? If so, you could try making your own hives out of treated 2x4s and cement blocks. There are some detailed plans here. Working with bees means you need protective gear: veil and/or a full suit, a smoker, and gloves. 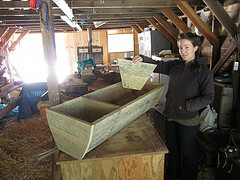 You’ll also need a hive tool, a feeder, an outer cover for your hive (for cold months), etc. Google “beekeeping supplies” and a ton of online stores will come up. If you’re lucky enough to live in a city with a beekeeper association, then hook up with them as soon as you can. They’ll likely have plenty of bees you can buy locally. You can also check out the American Beekeeping Federation for more information. If you need or want to buy bees by mail, check out this comprehensive list of apiaries. There are three different types of bees to choose from: Italians, Carniolans, and Russians. All have different benefits and drawbacks, depending on where you live and what you want, so research your options carefully before you decide on a breed. So, I know this is an incredibly simplistic look at urban beekeeping. Bees have to be fed. They have to be smoked if you want to pull out a frame to harvest honey. They can swarm, or die suddenly, or their hive can be attacked by animals. Beekeeping is not a simple affair, at least not at first. But it doesn’t look crazy hard. I’d highly recommend getting a book on urban beekeeping, if you’re interested. I’d love to hear back from you guys. Do you keep bees? Have any tips or advice you’d like to share to other readers who might want to get into urban beekeeping? Please write in, if so!